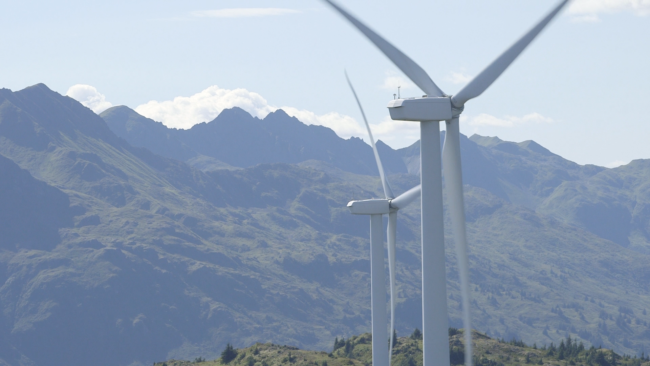 Since 2007, Kodiak has transformed its grid so that it now generates almost 100 percent of its power with renewable energy. The local electric co-op has managed to do that while keeping rates stable. In fact, the price of electricity in Kodiak has dropped slightly since 2000. It’s a model with lessons for remote communities from the Arctic to the equator — and for cities on the big grids of the Lower 48, from New York to Houston. It seems like just about anywhere you go in Kodiak, you can look up and see the wind turbines. There are six of them spinning on Pillar Mountain, above town. Giant, elegant and charismatic, the wind turbines are the most visible symbol of Kodiak’s quest to go nearly 100 percent renewable. And if the wind is blowing, they might account for 80 percent of the power used at any given moment. In the utility world, that’s a huge number. But over the course of an entire year, wind only supplies about 20 percent of the region’s power. The real workhorse in Kodiak’s system? Hydropower. When the Kodiak Electric Association (KEA) set a goal of 95 percent renewable energy back in 2007, the utility already had a major head start: Terror Lake, Kodiak’s hydro project, was built by the state in the 1980s. Ian Baring-Gould works for the National Renewable Energy Laboratory in Boulder, CO. He said many communities don’t have that option. “Kodiak is very unique in that it has great hydro resources and a good wind resource very close to the load center, which is really unique and has allowed them to do what what they’re doing,” Baring-Gould said. But Baring-Gould said Kodiak is still an example for other remote communities. KEA has proven it’s technically feasible to add a ton of renewable energy to a small grid and that it can make sense economically. And the way Kodiak built its system is also a lesson, he said. KEA built on its hydro resource step by step, problem solving for nearly a decade. The result is a system that combines wind and hydro, along with batteries and flywheels — a particularly sci-fi way to store energy. Along the way, it became perhaps the first system in the world to combine flywheels and batteries in this way. Baring-Gould said that process is a blueprint for other remote communities with stand-alone grids, from the Arctic to the Philippines. But Kodiak isn’t just an example for small communities. There are lessons for the big grids of the Lower 48, too. To understand why, just read the news: Hurricane Harvey knocked out power to tens of thousands of people, and it was followed by Hurricane Irma, which left millions without electricity. Massive storms like Irma and Harvey — and Hurricane Sandy before them — can leave tons of people without power for days or longer. And that’s increasing interest in microgrids: stand-alone systems that can disconnect from the larger grid. Places like hospitals, military bases and industrial sites want to be able to separate from the grid and generate their own power during emergencies. Once you go down that path, there can be a lot of other benefits. Brian Hirsch is an energy consultant in Anchorage. He said industrial sites or major hospitals with a microgrid might find it’s sometimes cheaper to generate some of their own power. What Kodiak has, by necessity, is similar to those stand-alone microgrids. Like so many other communities in Alaska, it’s too remote to connect to any larger grid. Baring-Gould said Alaska knows how to run the kinds of self-contained grids the rest of the world is just starting to wake up to. “Alaskans have been doing this for 50 years,” Baring-Gould said. Kodiak just proves you can take it a step further. If you need proof that this is not all pie-in-the-sky, just visit some of the system’s largest energy users: fish processors. James Turner manages the Ocean Beauty seafood plant in Kodiak. 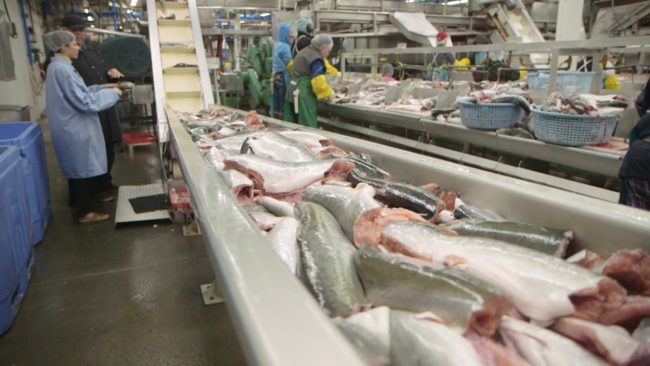 Inside, it’s a blur of bright lights, fish parts on conveyor belts and workers in hairnets and gloves. And then there are the freezers: many, many different kinds of freezers. Plants like this use a lot of power. So the cost and reliability of electricity are a big deal, Turner said. And Kodiak Electric has delivered on both. Is it important that Turner’s freezers and conveyor belts run off renewables? In Kodiak, that’s taken care of by the wind and the rain.